The Frenchman, who has held his role at Fifa since 2007, said he denied the "fabricated, outrageous" allegations. Football's world governing body Fifa has been engulfed by claims of widespread corruption since May, when Swiss police raided a hotel in Zurich and arrested seven of its top executives. President Sepp Blatter announced that he would stand down just days after winning re-election in June. Valcke, who last month was considering standing to be the new president, is Blatter's number two at the organisation but now faces a formal investigation by the Fifa ethics committee. Earlier on Thursday Eugenio Figueredo, one of the seven officials arrested in May, had his extradition to the United States approved. As well as the US inquiry, a Swiss investigation is looking into the bidding process for the 2018 and 2022 World Cups. Fifa has recently set up a taskforce to tackle corruption which aims to "restore the integrity and reputation" of the organisation. Valcke set off in a private jet to Moscow on Thursday ahead of a '1000 days to go' event on Friday for the Russia 2018 World Cup. However, he failed to arrive at his destination. I'm told his plane was turned around mid-flight and he returned to Zurich following a decision to suspend him from his role immediately. Sepp Blatter consulted with a number of football regional confederation chiefs - including Michel Platini - before making the decision to suspend Valcke. The confederation bosses are thought to have all backed him. 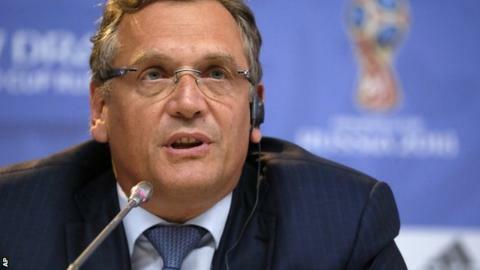 Valcke has also faced scrutiny in recent months over his role in an alleged $10m (£6.5m) bribe - an allegation he denies. United States prosecutors say the money was paid by South Africa to former Fifa vice-president Jack Warner in return for his vote and backing during their successful bid to host the 2010 World Cup. The money is said to have been transferred to Warner from a Fifa bank account after being reappropriated from South Africa's World Cup local organising committee budget. The New York Times and other US media outlets, citing US law enforcement sources, have claimed Valcke was the "high-ranking Fifa official" who signed off the payment. The Fifa secretary general has been outgoing president Sepp Blatter's right-hand man since 2007. He started his career in 1984 as a sports journalist for Canal+, becoming a director in 1991. He joined Fifa in 2003 as a director of marketing and TV. In 2006, Valcke was released by Fifa after a New York court said he lied in a sponsorship row between Mastercard and Visa. A year later, Valcke was hired by Blatter as the first non-Swiss secretary general. In 2011, Valcke denied Jack Warner's claim in an e-mail that Mohamed Bin Hammam "bought" the 2022 World Cup finals for Qatar. In June, Valcke also denied making a £6m payment connected with South Africa's bid to host the 2010 World Cup. Read more on Who are the indicted Fifa officials?